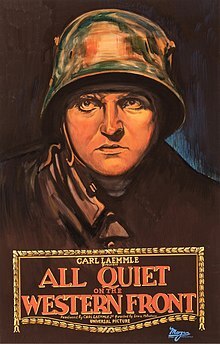 All Quiet on the Western Front (Scots: Aw Quiet on the Wastren Front) is a 1930 American epic Pre-Code war film based on the Erich Maria Remarque novelle o the same name. ↑ 1.0 1.1 All Quiet on the Western Front, afi.com; accessed March 24, 2014. ↑ Box Office Information for All Quiet on the Western Front, Box Office Mojo; retrieved April 13, 2012.